One of the “top ten” comfort foods on most everyone’s list has to be pasta. Dig deeper into which pasta dish would be at the top of the list and the answer would probably be macaroni and cheese. It is such a favorite that most of us have given it the nickname of mac and cheese. Make this three cheese mac and cheese gratin and serve it at your family dinner table or to friends for a weekend gathering. Either way, you will get lots of compliments, I’m sure. I make my mac and cheese with 1% milk which is a little lighter version but of course you can prepare it with whole milk, half and half or even cream, if you wish. I like to bake the mac and cheese in individual gratin dishes but it can also be prepared in a casserole for a group. This dish gets its great flavor from three cheeses, Gruyère, Fontina and Pecorino Romano. It has a crispy topping that makes every bite special and totally delicious. This makes two servings, adjust the recipe according. Bring a pot of lightly salted water to a boil, add the pasta and cook until al dente. In the meantime, place the minced garlic and oil in a bowl and heat in a microwave for 15 seconds to infuse the oil with the garlic. Remove from the microwave and stir in the panko breadcrumbs until well coated. Let cool then add the panko breadcrumbs and the Romano cheese and mix well. While the pasta is cooking, heat the butter in a saucepan until melted. Whisk in the flour and cook, stirring for one minute. Slowly add the milk and whisk until blended. Add the salt, pepper and mustard, whisk and then let cook for a few minutes until you have a smooth sauce. Add in the Gruyère and Fontina cheese and stir to blend. When the pasta is done, drain well and add to the cheese sauce and stir until combined. Divide the pasta into two individual gratin dishes that have been buttered and mound the cheesy panko crumbs on top. Place on a foil lined baking sheet and bake in the oven for about 10 to 15 minutes or until bubbly. If not brown on the top, place under the broiler for a minute but watch carefully so that the crumbs don’t burn. Remove from the oven and let rest for a few minutes before serving. The baked mac and cheese gratin has a wonderful cheesy taste from the three very flavorful cheeses…two in the sauce and one in the crisp and crunchy breadcrumb topping. I served the gratin with a salad of crisp romaine lettuce and grape tomatoes. A glass of dry white wine went perfectly. This is a comfort meal that will be on my “top ten” list. This entry was posted in Uncategorized and tagged cheese, comfort food, Dinner, food, gratin, mac and cheese, pasta, Recipes, top ten, vegetarian. Bookmark the permalink. You’re right–macaroni and cheese is my ultimate comfort food. This looks delicious. Are you in the path of the winter storm? Take care. Hi Bonnie, I do think that this dish tends to be a favorite of most people. Yes, I think all of New England will be in the path of Nemo…a most unwelcome visitor.Thank you for your thoughts and comment. Karen this is in my top 3 comfort foods if not #1. I make it from scratch much like you do as this was one of the first things I learned to cook in Home Ec class in 7th grade. I love some of the variations you have here and will give it a try. YUMMY!! Hi Donna, I’m glad that you like my version of mac and cheese, I hope you will enjoy it. Thank you for your nice compliment. Mac and cheese is my favorite dish ever. In fact when the S.O. and I go to New Orleans and San Antonio at the end of the month we are hitting a place in each city that claims to have one of the best mac and cheeses in the country(http://www.foodandwine.com/slideshows/best-mac-and-cheese-in-the-us/1#!slide=1) In the meantime, I might have to whip up a batch of this to tide me over. Hi Emilie, It sounds like you are a woman on a mission. Until you get a chance to try the ones on your trip, I hope you will enjoy my recipe. Hi Amy, I have to agree with you. I think you will enjoy the crispy topping the next time you make it…it adds a lot to the dish. Thank you for your nice compliment. Ooh that looks so good! I haven’t made mac and cheese in ages. Perfect food for the weather we’re having! Hi Kate, I tend to make mac and cheese when I need a warm and comforting meal. I don’t think there is anything better. Thank you for your nice compliment. Hi Roger, I can just imagine what boarding school macaroni and cheese must have been like. I’m glad you like my version with a more substantial pasta. Thank you for your nice compliment. Now my mouth is watering. I love the idea of baking it in the individual gratin dishes. I usually bake it up in a large casserole dish and serve the casserole dish on the table with squares cut out of it. I also use panko bread crumbs. Makes for a great crunchy topping that’s perfect for mac and cheese. I love the idea of your addition of fontina and pecorino. I’ve used Gruyere and English white cheddar and Gorgonzola before in mine, but I’ll defintiely have to remember the combo with the Gruyere and the fontina and pecorino, those really seem like three complimentary cheeses! Hi Ducky, I’m glad you like my idea of individual gratin dishes. Not only does it look nice, I think you get more of the crunchy topping with each bite that way. I think you will like the combination of the three cheeses in this dish. Thank you for your nice compliment. I absolutaly agree with you, certainly one of the top comfort food dishes in our house, I like the way you did your topping great idea to femember. Hi Barbara, I’m glad you like the crunchy topping that I added. I love the texture it gives to the dish. Thank you for your nice compliment. Mouthwatering and ever so flavorful! A wise choice of cheeses and pasta. Thank you Rosa, for your nice compliment. I’m glad that you like the recipe…the three cheeses make this dish very flavorful. This sounds absolutely delicious. I can never resist a good bowl of mac and cheese. Gruyere is also one of my favorite cheeses. I would love a big bowl of this kind of comfort! Hi Kristy, I’m glad you like the recipe…I think the Gruyere adds so much flavor to the pasta. Thank you for your nice compliment. Karen, this looks perfect. Mac and cheese is my ultimate comfort food. When I want to make a special meal for someone, this is always, without exception, on the menu. I love this non-cheddar version and can’t wait to make it. Thank you Karen, for your nice compliment. As much as I enjoy cheddar cheese, I do like this combination of cheese for this dish. I hope you will like it as much as I do. Well, it *is* a mac and cheese kind of day! Hi Marie, This definitely qualifies as a mac and cheese kind of day. I think everyone in New England needs a comforting meal for the next couple of days. There is nothing better than mac and cheese …..unless it is THREE mac and cheese!! Can’t wait to try it! Thank you Kelli, for your nice compliment. I hope you will enjoy my version with the three cheeses. Like your ideas of infusing the oil with the garlic in the microwave and making individual dishes. I will make the lighter version using 1% milk. How much snow are you expecting from Nemo? Ah, looks excellent! Perfect for a winter day. Thank you Phil, for your nice comment. I’m glad you like the looks of the mac and cheese. It really is good on a winter day…very comforting. OMG this is gorgeous! I can’t wait to try this! I bet it is decadent. Thank you Anna, for your lovely compliment. It is decadently delicious. I hope you enjoy it. Who doesn’t love Mac ‘n Cheese? One of my childhood favorites. I have to say I don’t understand why anyone makes this from a box when with just a bit of effort you get a superior dish. I always use Romano or Parmesan too, and sometimes Gruyère; although I more often use Cheddar. Never tried Fontina in mine, though — I really like the idea, and will give that a try. Good stuff — thanks so much. Hi John, I’m glad you like my version of mac and cheese. I think the Fontina gives a lovely creaminess to the dish as well as flavor. I agree…it doesn’t take much effort to make this dish and it is way better than anything out of a box. Thank you for your nice compliment. Hi Anne, I’m glad you like my version with the three cheeses and the little bit of garlic. It does make a very flavorful dish. Thank you for your nice compliment. I love mac/cheese. I made need to try yours this weekend! Hi Jeannee, I’m glad you like my recipe for mac and cheese…I hope you will enjoy the dish. Thank you for your nice comment. This looks sinfully delicious and love the combination of the 3 cheese. Ah! I have to make this soon. Would be perfect on a cold and rainy day like today. Thank you for visiting Rachel and your nice compliment. I hope you will enjoy the dish. Stay warm. I made one too lately..It’s just that kind of weather..being bombarded again today! Hi Monique, We can’t do anything about the awful weather but we can certainly prepare comforting food to warm our spirits. Thank you for you comment. Comfort food at it’s best. My sister used to make one like this when we were growing up (sans wine pairing of course) and loved it. Brings back all kinds of great memories. Hi France, It is nice to know that my post brought back nice memories. Thank you for your lovely comment. I agree Karen, mac ´n cheese is a favorite, but then what´s not to like about pasta, cheese and a crunchy top? And mustard with gruyere is just an amazing combination. Have a great weekend! Thank you Paula, for your lovely compliment…I’m glad you like my version of mac and cheese. I hope you have a nice weekend as well. Hi Celia, I find it so interesting to learn about the different ways similar ingredients are prepared in different parts of the world. I think you are right about mac and cheese being an American dish. I do like the flavor that the three cheeses gave to this dish. Thank you for your lovely compliment. I haven’t had a mac and cheese in such a long time, this one looks perfect and with the combination of the three cheeses, would taste incredible! Definitely worth the calories. Hi Eva, I’m glad you like my version of mac and cheese…the flavor from three different cheeses is good. This is not what you would call a low calorie dish but is lighter than many recipes with the use of 1% milk. I agree with you…it was definitely worth the calories. Thank you for your nice compliment. Hi Uru, I’m glad that you like the cheesiness of this dish. Thank you for your nice comment. Mac and cheese is such a simple and hearty dish that everyone should have a basic version of it in their repertoire which can be customized with whatever’s available. I usually use elbow macaroni as the pasta though I’ve used rotini as well. I think I should pick up some rigatoni though as I think it would go well with tomato and meat sauces as well. And the fontina cheese is also new to me. Crumb toppings are too fussy for me to use when I’m just making mac and cheese for myself. 🙂 I have some cheese sauce in my freezer and am debating what else to include in my next mac and cheese dish and whether to use it as a side or a main dish. Thank you for your comment, Boleyn. The nice thing about mac and cheese is that it can be adapted to each persons taste. An ultimate comfort food! Yum! Hi Angie, I have to agree with you…I think we all enjoy a nice dish of mac and cheese. Thank you for your compliment. Thank you Mad Dog, for your nice compliment. This is a very flavorful dish that I think you would enjoy. This makes my mouth water. I love mac ‘n cheese no matter how it’s fixed. The only problem is I try to eat it all at once which is not a good thing for the waistline. Stop the maddness………….this looks divine! I want it NOW. Have to admit I’ve never been overly fond of macaroni cheese, until I made my healthy version recently. With your three cheese involved I’d love to tuck into yours. I’m really hoping that doesn’t sound crude! I’m sure you know the British term to tuck into. Hi Johnny, I do know what your expression tuck into means…I’m so glad that you like my three cheese version. I do appreciate where you are coming from…I think some recipes are way to heavy. Using 1% milk keeps this version much lighter. Thank you for your nice compliment. First of all your mac ‘n cheese looks absolutely beautiful and I love the idea of individual dishes! Secondly, thank God that Celia, a very wellknown and beloved Australian blogger has commented before me, because it would have been rather odd for me to admit I have neveer had mac ‘n cheese in my life, even tho’ I have been married to two wellknown foodies 🙂 ! You just might believe me now 🙂 ! But perhaps some cold night next winter I’ll look into my file for this . . .
Hi Eha, I do enjoy when you stop by for a visit. I love your lighthearted comments…even knowing that you have been married to two foodies and still haven’t had mac and cheese. I won’t tell a soul and come winter I think you might like trying this dish. Us Americans do love mac and cheese and I think those of you from the land of Oz would enjoy it as well. 🙂 Thank you for your comment. Huh – still have me over for a friendly visit when I admit I’m not all that keen on pot roast either: had never had beef not blue or rare until a US friend presented that!! Hmm!! Actually, to be fair, methinks ‘Macaroni baked with cheese’ DOES appear in ladies’ magazines here these days and have seen the same ‘Macaroni with four cheeses’ also! Just to say hope that Nemo does not do any damage your way! After months of hell we seem to be in a hiatus period . . . Yes, I would still have you over. Lots of snow in New England…definitely looking forward to spring. Now thats some REAL good looking Mac n Cheese! Thank you Natalie, for your nice compliment. I’m glad you like this dish. It is as good as it looks. Oh my god! Think I died and went to heaven. Thank you for this recipe. I can hardly wait to try it! Thank you Elizabeth, for your lovely compliment. I’m glad you like the recipe. I hope you will enjoy the dish when you try it. I…love…macncheese!!!! Yeah, who doesn’t right? Hehehe! I wonder what a drizzle of truffle oil might do. Yummy as always, Karen! Thank you Ruth, for your nice compliment. I do think you are right about most of us loving mac and cheese. If you like truffle oil, you might add a drizzle. Baked Mac and Cheese is without a doubt one of my favorite “comfort food” dishes. Looks absolutely delicious! Hi Tessa, Our group of mac and cheese lovers is growing. I’m glad that you like this dish…thank you for your nice compliment. Oh I love your blend of cheese, Karen! And that bread crumb topping is a must! Thank you Laura, for your nice compliment. I think the blend of cheese gave lots of flavor. Oh yes…the crunchy crumb topping is a must. Looks good but this is still my fav using Old Cheddar and pncetta,,,especially Vermont Old Cheddar! Hi Reg, I think we all have our favorite mac and cheese recipe. As they say, everything is better with bacon, so I’m sure the one from Tyler Florence is good. Thank you for your comment. Hi Anne, You are right about not over indulging in mac and cheese but you can’t help but love it. Thank you for your nice compliment. Quite simply – pure comfort. Hi Mandy, I have to agree with you…it is pure comfort. Thank you for your nice comment. Thank you Tandy, for your nice compliment. Mac and cheese is a very comforting meal. It’s hard to believe that someone has made it through life without macaroni and cheese. It’s also hard to believe that the grandkids still love Kraft’s best! Hi Rosemary, I think mac and cheese tends to be an American dish but I hope those who haven’t had it give it a try. Yes…the little ones do like the Kraft boxed version. Thank you for your comment. I literally think my heart just skipped a beat! This sounds and looks wonderful! Thank you Joanne, for your lovely compliment. I’m glad that you like the recipe…it was as good as it looks. Looks perfect Karen especially with the cheeses you used. Did you guys get much of the snow? 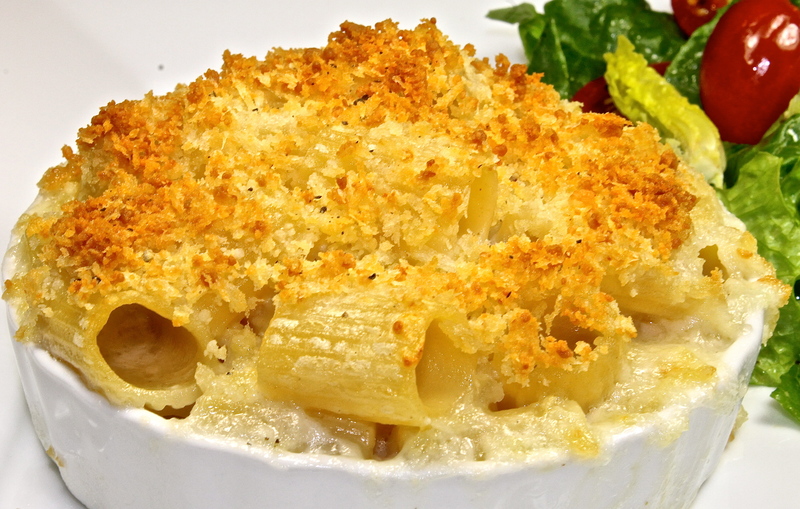 A great way to prepare Mac & Cheese, Karen, especially with the crunchy bread & cheese topping. As you say, served with a salad and glass of wine and one has a great, comforting meal. I see you’ve been commenting this morning, so, at least you’ve got power. I hope nothing happens to change that, and, that you and yours remain safe & warm, Karen. Thank you John, for your nice compliment. I do like adding the topping for a nice crispy bite to go along with the creaminess of the pasta. Since we get a lot of snow each winter here in New Hampshire, we are well prepared for any storm. We have a whole house generator that comes on five seconds after a power loss. My small tractor has a snowblower, the big John Deere has its bucket on, and my husband’s truck is in the barn with a plow on the front for times like this. Thank you very much for your kind thoughts. Thank you so much Judy, for the thoughts and compliment. This is the perfect meal to enjoy when you want a warm and comforting meal. This looks wonderful on this cold, white, winter day, Karen! There is nothing more comforting than mac & cheese and this sounds like an excellent version. I love the mustard in this one. Hi Susan, It does seem that this post was very timely when many people are wanting a warm and comforting meal. I’m glad you like my version. Thank you for your nice compliment. Anytime cheese, pasta, cheese, butter, cheese, cheese…you get my drift…are combined, well it has to be love!! LOL! Hi Susan, I do get your drift and have to agree with you. Pasta and cheese are a winning combination. Thank you for your nice comment. You know me I could take or leave pasta. Ha, that’s a good one. Seriously, this looks wonderful. Hi Greg, Take it or leave it…right! I’m glad you like the looks of the mac and cheese. Thank you for your nice compliment. This particular dish has never been a staple in our family because it is not typically Italian but I would love to find some grain-free pasta I could eat or maybe I have to create it. Hi Suzanne, This recipe would be a challenge but if anyone can figure out how to make it…you could. Thank you for your comment. Oh my, this looks and sounds amazing! It’s been cold and snowy here and nothing sounds better than a dish of your macaroni and cheese right now. Thank you Marlene, for your nice compliment. This is a great dish to have on a cold and snowy day. Stay warm. Oh my, that is some meal! I love the idea of three cheeses, and a crunchy top make me fall in love with it! Stay warm Karen. I heard you have a big snowfall this days. Be safe. Thank you Marina, for your thoughts and compliment. I do like the combination of the cheeses but agree with you about the crunchy top…it makes the dish special. Thank you Betsy, for your nice compliment. I’m glad you like my three cheese version of mac and cheese. Macaroni cheese was always a favourite dinner growing up. My kids however won’t have a bar of it…maybe I should just make some for me. Hi Brydie, Kids that don’t like mac and cheese…that is something. One nice thing is that with this recipe you can prepare individual portions. You could have one for yourself and freeze one for later. Oh goodness – that looks sinfully delicious! Thank you Ladyfi, for your nice compliment. This really is a delicious mac and cheese…I’m glad you like it. Hi Carolyn, I’m glad you like the dish. I have to agree with you…it doesn’t get much better. Thank you for your compliment. Hi Charlie, I’m happy to hear that mac and cheese is popular in your home. I think we all love it. Thank you for your comment. One of my favourites. This looks gorgeous Karen and I bet it’s killer tasting with the three very flavourful cheeses. Thank you Nazneen, for your lovely compliment. I think the three varieties of cheese really give this dish a terrific flavor. Hi Barbara, I do like preparing this recipe in the individual gratin dishes. If I prepare it in a large casserole, we are tempted to eat more than we should…it makes a nice presentation as well. Thank you for your nice wish and compliment. I hope you are having a lovely weekend as well. I just read your post on Alsace and feel bad that I have not been there yet. My grandfather was from Alsace (Sélestat) and my cousin’s daughter lives there – I’ll try to go there next time. I think everyone loves macaroni and cheese – yours looks especially yummy. Hi Vagabonde, Thank you for your compliment about the mac and cheese. I do think that you should try to visit Alsace, especially if you have family living there. Photos can never do it justice…the area is beautiful. 122 comments? Good heavens! 🙂 I guess it is the draw of comfort food…. mmmmmmm! Hi Rachel, I do have wonderful readers like yourself that have been kind enough to leave a comment on the mac and cheese. It is a comforting dish. Thank you for your nice comment. I like the combination of cheeses that you used; sounds delicious! I am a big fan of cheddar cheese in my mac n cheese but this is not the easiest to find here in Germany. I think your trio might be more readily available in my locale. Thanks for the recipe. Hi Laura, I’m glad you like the mac and cheese recipe. I have to agree with you…I think the cheeses I used would be much easier to find in Germany than the cheddar cheese that you are used to. Thank you for your nice compliment. I love that another cook uses Wondra. I don’t use if often, but when I do, it saves my sauces. It has such a fine texture there are never any lumps. Who wouldn’t love this mac and cheese with Gruyère and Fontina in the mix. Hi Kristi, I’m glad that you like the mac and cheese with the Gruyere and Fontina. I do like using Wondra for sauces and also as a dusting on meats before pan sautéing. As you say, its fine texture makes a big difference in so many recipes. Thank you for your comment. This looks delicious! (And like something we could soon try. The detox diet will be done on Tuesday.) You always post such good recipes. I drool every visit to your blog. Thank you Kathy, for your nice compliment. I’m happy to know that you enjoy my recipes. I think you have done terrific sticking to your detox diet for three weeks. Karen, macaroni and cheese is definitely one of my favorite comfort foods along with soup. This is a delicious recipe. Looks amazing! I love how you broiled the top.., yummy!! Hi Judy, I’m happy that you agree about mac and cheese being a favorite comfort meal. I think the crunchy cheese and panko topping adds both texture and flavor to the dish. Thank you for your nice compliment. Oh I’m drooling over that picture!!! What a perfect bowl of mac & Cheese!!! Great cheeses, great recipe! Thank you so much, MJ for your kind words. I’m glad you enjoyed the post about the mac and cheese. Good thing I saw this yummy recipe before my cleanse. It looks fantastic! Hi Chunklet, Thank you for your nice compliment. Good luck with your cleanse…it seems a lot of people are trying to eat healthy. Absolutely a favourite of naughty pastas, I think it’s time to have a creamy Indulgence for dinner. After work its straight to the deli to grab these cheeses for me. I haven’t heard of Fontina cheese im hoping they will have it at the local deli, any other suggestions for a substitute? Thank you Caylean, for stopping by for a visit and your nice comment. Fontina is a semi soft cows milk cheese that has a mild slightly nutty flavor. I think you could use any good melting cheese of your choice…perhaps provolone. I hope you enjoy the recipe. Hi Raymund, I’m glad you like the cheese combination in the mac and cheese recipe. Thank you for your compliment. It’s 1 degree above zero here and Big Man and I have been working in our new place iwth no heating – please send 2 extra large portions by express mail! Hi Tanya, It is hard working in that kind of cold. I wish I could pop over with a nice big portion for the two of you. Stay warm. What a beautiful dish & photo. I don’t know how you always manage to capture such perfect images of your food but you do such a wonderful job. I’m admiring that melty cheese & the lightly browned top is just perfect. I love mac & cheese because you can doctor it up in so many ways. I think my daughter lived on it for her first 18 years. At least now she’s willing to diversify. I appreciate you kind words, Diane. I’m glad that you enjoy the photos. I agree with you about the diversity of mac and cheese…there are probably as many ways to prepare it as there are cooks. I love the idea of sprinkeling the mac&cheese with panko – I can just imagine the lovely crunch it gives to the dish. Heaven! Hi Afra, I’m glad you like the crispy topping. I think the different textures of soft and creamy and crunchy go so well together. Thank you for your nice compliment. Hi Patty, Thank you for stopping by for a visit and you nice compliment. I’m glad you like the recipe for the mac and cheese. Karen, I have never made a “Mac & Cheese” dish, ever – never really sounded that good to me but when I read your recipe and see that you are using three different and wonderful cheeses in this dish, I might change my mind and try it some day soon – it does sound delicious and it looks wonderful too! You always present everything in such a nice way! Thank you Andrea, I think you and your family would enjoy mac and cheese…especially this time of the year. You might like to try it as a side dish in place of potatoes or spaetzle. Thank you for your nice compliment. I feel comforted just looking at your photo! Love your recipe and it is always nice to have another Mac & Cheese for the files. Have a Happy Valentine’s Day. Thank you Teresa, for your nice compliment…I’m glad you like the recipe. I appreciate your wish, I hope you have a lovely day as well. I just love mac and cheese and this looks wonderful – I’m going to try it! Hi Meg, I’m happy to know that you like my version of mac and cheese and I hope you will enjoy the recipe. Thank you for your nice compliment. Ok, this is #1 comfort food! What a scrumptious mac & cheese you’ve made – I wish I could dive into a bowl right now. I love your selection of cheeses, too. Hi Hannah, I’m glad that you agree with me about mac and cheese being true comfort food. I think the variety of cheese in this dish gives it an excellent taste. Thank you for your nice compliment. Hi Kat, I don’t know what happens with the reader sometimes…I’m missing lots too. I appreciate that you stop by and enjoy the posts. This mac and cheese is very flavorful with the three cheeses. Thank you for your nice compliment. Hi Jed, What a lovely compliment…thank you so much! I do think the crispy topping adds a lot to the dish. Oh my oh my – that has to be my favorite!! I am a sucker for any “mac n cheese”- Yours looks so restrained and wonderful in it’s portion sizes. That would never fly in my house LOL!!! We have no self control around here! These are looking good:) I will try baking too, I usually skip this part. Hi Ella, Thank you for stopping by for a visit and your nice compliment. I think you will enjoy the crunchy topping when you bake this dish.